Many times I have heard from people who tried to learn Taiji (Tai Chi) that the moves were too complex and the form was too long to remember. Instead of using their class and practice time to learn healthy principles movement, they would mostly be overwhelmed. The Simple Taiji Form solves that problem. This form consists of just two postures repeated six times, plus some transitions. By investing a shorter time in learning the moves, you are able to explore many principles of Taiji Qigong. You aren’t spending all your efforts in remembering (and forgetting). The Simple Taiji Form is a fun and accessible introduction to the world of Taiji. One repetition of this Qi-building form can be done in only 3 or 4 minutes. This short sequence trains balance, builds strength, improves memory, promotes health, and increases physical stability. Once you learn it, the form has many levels of practice within the same moves: It is a trove of riches of innumerable lessons and blessings. Daily practice of this little form will make your life better, healthier and probably longer. The Simple Taiji form will strengthen your whole body, lower your blood pressure (if needed), improve the health of your spine, replenish your energy resources, improve your breathing, aid your digestion and elimination, and release tension. I learned this sequence from Minke de Vos in 1997 and 1998. She learned it from her teacher Mantak Chia. In August of 2010 an article was published in the prestigious New England Journal of Medicine citing a study of Tai Chi for the painful, baffling syndrome of Fibromyalgia. It turns out that there were significant mental and physical improvements for the Tai Chi group after only 12 weeks of supervised practice. The practices were one hour long, two times a week. Even more telling, the improvements remained 6 months later. Many scientific studies have been done to investigate the healing benefits of practicing Qigong and Tai Chi. “Tai Chi,” in most of these studies, is essentially another type of Qigong: A short movement form done slowly with attention to posture, movement, the body, mind, and breath. Though these short forms are taught to people unfamiliar with Qigong or Tai Chi, they still have quick, predictable, good results. Qigong, in all of it’s facets has been used as a health practice for thousands of years, undergoing advancement and refinement through all of those centuries. It has been proven over and over again to be a super source of health. Modern scientific studies are coming to the same conclusion. Qigong and Tai Chi are not just relatively inexpensive way’s to feeling better, they are natural ways to healing that are super-duper cheap compared to modern medicine. 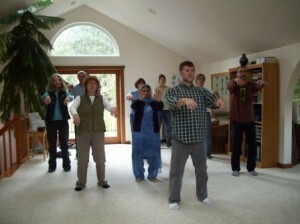 Just about any slow moving, body-focused, energy-feeling type of Qigong would help ease the symptoms of fibromyalgia. These self-healing exercises can be the basis for creating a healing lifestyle. Doing the Five Flows set twice a day would make someone feel better and begin a river of healing. The Five Flows is an introductory set of special movements, similar to a basic Tai chi form. There a several primary healing mechanisms in the set. Shaking and tapping release physical stagnations. Breathing practices revitalize the blood and relax the nervous system. Qi charging exercises build up the internal organ strength and lymph flow. My thesis is that such results–even at the introductory level–will help the healing process for fibromyalgia and a host of other syndromes. Medical Qigong is the subset of Qigong where very specific movements, meditations, sounds and breath-practices are given for medical conditions. Medical Qigong has prescription exercises that can help with fibromyalgia. 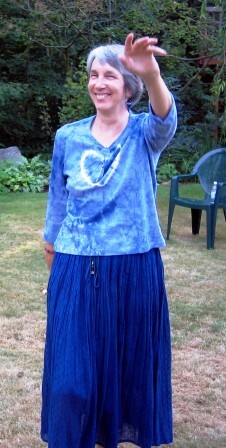 My Medical Qigong teacher recommends purging blocked energy from the Liver; and charging the Kidneys and Spleen. Please note the terms “Liver,” “Spleen,” and Kidneys” have different meanings than the strictly anatomical and physiological meanings used in Western medicine. They have a more functional, systems-approach according to the tenets of Chinese Medicine. And Medical Qigong. The Liver blockage impairs Qi flow throughout the body and creates too much toxic heat. The low Kidney energy means fatigue, poor memory, and an inability to control a too-hot Liver. The low Spleen energy (meaning the digestion is sluggish) also is overwhelmed by the Liver excess. Doing specific exercises daily is what it takes. Some tutoring might be necessary. Doing these kinds of processes is much like tuning an instrument. The closer you get it to just right, the better it works. For Liver stagnation, the “guo” sound is a good Qigong prescription. This is a deep, droning, “Gwwwoooo.” Guo is pronounced like cartoon character Elmer Fudd would saw “grow.” Healing Sound Qigong is used to put focus and vibration into target organs, thus leading to the release of stagnation. Always feel healing sounds vibrate in the target organ or area. For the Kidneys, the Charging the Kidneys exercise from the Five Flows set is a good choice. You can do it while imagining blue energy filling the Kidneys, like warm ocean water. For the Spleen, put both hands on the Spleen and stomach area (on the left side of the upper belly ) and breathe yellow into it. Feel it fill up, warm up, and get cozy and happy. Each of these exercises would need many repetitions, 50 to 100 or so. Of course, this is just a beginning idea. Everyone has different needs. Fibromyalgia is a kind of a messy attic space diagnoses, and it is not just one thing. Whatever is going on with someone with fibromyalgia—depression, uncertainty in life, internal Qi stagnation, too much head-thinking, too many years of push, push, push, or whatever—Qigong can help move the Qi along and out and bring back natural, fresh internal flows. Come to one, two, or three classes a week for the same price! Mondays 12:00 pm to 1:00 pm. Mondays 6:00 to 7:00 pm. Fridays 12:00 to 1:00 pm. Location: 1095 East Axton Road. This is a few miles north of Bellingham. Taiji Qigong is a set of graceful, meditative exercises based on the healing martial art of Taiji. This 18-movement set is also known as Shibashi. The movements are easy to learn and practice and have many healing benefits. Taiji Qigong is great for those wanting some of the grace, beauty and health benefits of Taiji Chuan but aren’t ready to commit to 10 years of difficult training. Taiji Qigong is effective in opening major acupuncture points, balancing the brain and body, and improving the strength and flexibility of the spine. You will develop smooth coordination, gain more body awareness and you will attain a peaceful sense of empowerment. Qigong is slowly making inroads on the consciousness of America. An article on one of my students was recently in the local newspaper here in Bellingham, Washington, USA, North American Continent, Planet Earth. 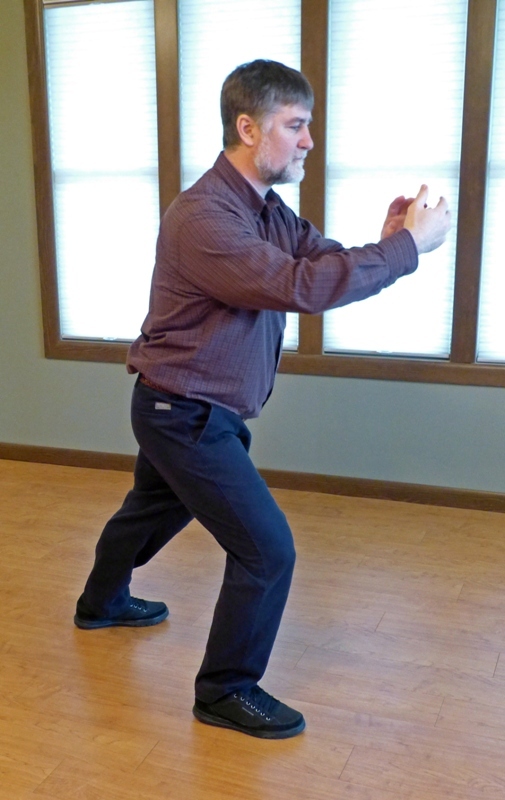 Lee Willis has been benefiting from Qigong for a decade or so. I find Lee to be one of the most present, friendly, happy, helpful and engaging people I know. The photo and article don’t quite show her effervescence. And she vehemently denies–as the article speaks of–that she is a sufferer or victim of any kind. In the decade plus I have known her, I agree with this self-assessment. She leads not just an active life, but a thorough life. Anyway, read the article. The benefits and joys of Qigong (and Tai Chi) are trickling up, seeping into general consciousness. Maybe we will soon see a bigger awareness of these arts. Most individuals–and the country as a whole–would be better off practicing these internal movement arts. 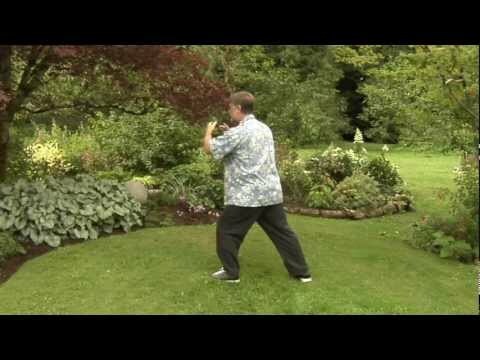 Lee Willis teaches a short, gentle Tai Chi form that was designed for people with arthritis (whether or not they are victims), but the form is actually great training for anybody seeking better internal and external balance, smoother movement and less pain in their bodies. Lee mentions the principle of modifying in the article, which is so key in making a practice work for whatever your current physical needs, abilities, and areas of concern. To restate the principle of modifying: Find a way to move that doesn’t hurt, whether this means using less effort, doing slightly different movements, or making the range of the motion smaller. By modifying as necessary, you engage your body in relaxation, which engenders healing responses at all levels of your being. Another point she touches upon is the fact that most of us have some “limitations” in our health to deal with. Actually, everyone does. Working within the boundaries of whatever your current abilities are–rather than fantasizing or blithely stepping into the dangerous water of overdoing–is so much of what Qigong is all about. When engaged in healing practices, activated movement within relaxation is necessary. Working within your limits is both wise and pleasurable. Pushing into pain is the path to problems. There are a number of ways to look at Qigong in order to understand it better, methods of breaking down aspects of it into categories. In future posts I’ll talk about several different such ordering methods. One way to look at Qigong in terms of how the exercises are organized: whether you are doing a single exercise repeated; a set of exercises drilled repeatedly and in order; or a sequence of exercises done in a flowing pattern. Single exercises are done by themselves, repeatedly. These are usually drills of foundational movements or meditations that help you gather a particular energy or develop a particular important skill. These drills might also be taken out of a set or sequence and practiced alone. A single exercise might be a prescription for your condition. Two examples are doing lots of Shaking the Body to release tension, or performing many reps of the Inner Qi Shower to release and descend excess heat in the head. Another example of this is building balanced energy in your hands for healing with the exercise Charging the Qi Ball. The Golden Ball (also called 8 Actions of Qi) is an 8-movement single exercise I learned from my Medical Qigong teacher Jerry Alan Johnson. The Golden ball is particularly good at balancing your body’s Qi field. Swimming Dragon is a sophisticated Single Exercise that is great for the spine and other joints of the body. The best way to practice Single Exercises is to do them for a period of time, rather than a set number of repetitions. For instance you could decide to practice the exercise over and over for 5, 10 or 20 minutes. After a few minutes you will get into a groove. You’ll be riding a wave of a rhythm that takes you with it. In my next post I will talk about Sets.